SUMO-HD----These are made from 30mm solid EN8 engineering grade CARBON STEEL BAR, designed to be used by all, on & off road, these bars are clear zinc plated for corrosion resistance. 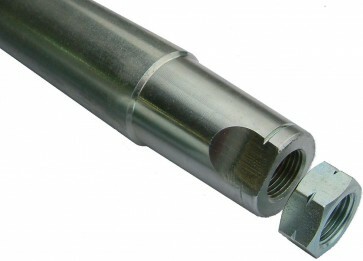 All the sumobars are supplied with locking nuts, the sumobar LOCK NUTS are full nuts (not like the cheaper copies which come with half nuts), this is for strength and security with less chance of rounding the nut whilst tightening them, both ends of the sumobars have machined flats for ease of tightening the lock nuts to the bar and the right hand thread is easily identified with a grove machined around the bar and the lock nut. Please remember all SUMOBARS are made from engineering grade steel, not to be confused with cheaper copy bars made from a low grade of mild steel. SUMOBARS are the original Heavy Duty Steering Bars and arguably still the best, they are used all around the world from on road, off road, comp safari to extreme off road.